The decision last month by Palm Drive’s Board of Directors to reject the doctor-led Foundation Plan that would have kept the hospital open was the moment of truth in the contentious struggle to retain a life-saving emergency room open in West Sonoma County. Unfortunately for Palm Drive Hospital and our community, truth was noticeably absent in the reasons given for rejecting the Foundation’s lifeline proposal. Instead, we were provided with misleading legal advice from the district’s $520 an hour bankruptcy attorney—(whose San Francisco law firm also represents, in other matters, Wells Fargo Bank). This advice, which can be seen in exclusive video footage below, appears to benefit Wells Fargo Bank, which is trustee for Palm Drive’s $22.9 million bond portfolio, at the expense of the hospital’s survival. These goals were apparently determined by Palm Drive’s Board without a single public meeting, a potential violation of California’s Brown Act, which says that such decisions need to be debated openly, with public input. During my five week investigation into why our community’s beloved, famously caring rural hospital closed (and what will be needed to resurrect it), I became aware of consistently focused message points in the statements made by the hospital’s CEO and Board members, as well as in letters to local media, and a surprising editorial that appeared in the Sonoma West a few days after the hospital closed its emergency room for the first time more than 70 years. Palm Drive Hospital is dead and there is nothing that anyone can do to resurrect it. This is the new normal. Accept it and go quietly into its dark night. Our community is in mourning and anger is natural, but we should not criticize or second guess the CEO or Board, because they’ve done the best they can. The hospital has fallen victim to a national, inevitable trend toward consolidation of emergency services into larger, more efficient, and more competitive mega-hospitals. It would be “wrong and foolish” to repeal the Palm drive parcel tax that was voted on in 2004 to support an emergency room and acute care facility. Last night, my hunch was confirmed, more demonstrably than I could ever have imagined, when I received a copy of a secret public relations plan for Palm Drive Hospital. 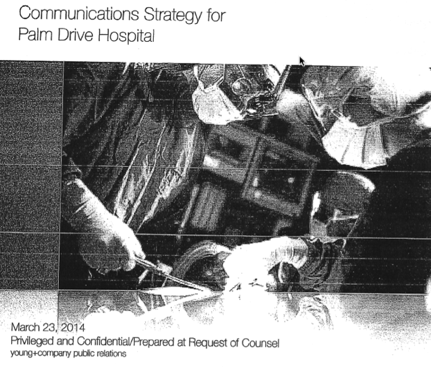 The secret memo, from “Young & Company, titled, “Communications Strategy for Palm Drive Hospital,” is dated March 23, 2014 and is, mysteriously, marked, “Privileged and Confidential/Prepared at Request of Counsel.” It is signed by Palm Drive’s CEO, Tom Harlan, and Marcus Young, representing Young & Company. Suspiciously, Young & Company, has no website, no phone listing, no business license and the address provided in the signed agreement is a P.O. Box. Even more suspicious, Marcus Young is listed on this website as the number two man and Executive Vice President of a major San Francisco public relations firm called Gauger & Associates, which lists, among its clients, Wells Fargo Bank. Because Young signed through this independent, unknown corporate identity (with a box number as an address), he avoided a waiver requirement—and this need to disclose Gauger’s representation of Wells Fargo to Palm Drive’s Board or CEO. One disturbing truth about this mysterious shutdown playbook is that it was created and agreed to by Palm Drive’s CEO, and, presumably, its elected Board of Directors, before there had been a single public hearing about closing the hospital. For the Palm Drive District Board, a municipal government agency, to meet in private and decide on closing a hospital, and the emergency room that the District was created to provide, without a single public meeting, seems to violate California’s Brown Act. (The Brown Act says that decisions and deliberations made between more than two elected officials of a governing entity in California need to be made in public). The first public meeting to announce the bankruptcy of Palm Drive Hospital and its imminent closure was on April 1. The public was given just 24 hours notice, yet more than 250 people crowded the first public meeting on this subject on April 1. Few, if any, of the emotional speakers present supported the closing. Sebastopol’s police and fire chief soon warned about fatal outcomes if the emergency room closed, and pleaded with Board members to find a way to keep it open. Palm Drive’s doctors immediately began speaking with the Palm Drive Foundation about a plan to keep the hospital open. Incredibly, Alvarez & Marshall, the high-priced international consulting firm that Palm Drive Hospital spent tens of thousands of dollars of their depleted cash on, never interviewed the fire or police chiefs, nor did they speak to a single one of the dedicated, highly successful local doctors who managed health care at our renowned hospital. Instead, they looked at the numbers, their downward trends, and mounting payables, and decided that pulling out of a financial death spiral was impossible. They never considered requesting from the doctors, or the foundation, a different strategic model to save the hospital and keep the emergency room open. In closed session, Alvarez’s analysts reported to the Palm Drive Board that failure was the only possible outcome. The Board’s job, they were advised, was to hire a bankruptcy attorney, a communications specialist, and another expensive out of town financial advisor specializing in hospital shutdowns (Nobody will answer my question about who recommended these shutdown specialists). And, as part of the playbook, the District Board and management would make sure that the parcel taxes that Wells Fargo Bank received for the bond holders were not threatened by bad publicity, a public repeal effort by taxpayers not wanting to pay for a closed hospital, or, it would seem—any plan that would keep Palm Drive Hospital open. When I spoke to Sebastopol’s savvy Police Chief Jeff Weaver shortly before the hospital closing, he questioned why the public was not given more advance notice of the closing—and more time to respond to it. Indeed, state law stipulates that a hospital must give their community 90 days notice before shutting down its emergency room. But because of the purported suddenness with which the Board found itself destitute, they got special dispensation from the state to close in just 20 days. A more troubling problem with the secret communications plan to shutdown Palm Drive Hospital is its objective of “protecting the parcel tax as the hospital closes.” This goal does not seem to serve the public interest the way keeping a life-saving emergency room open does. But it clearly serves the interest of Wells Fargo Bank, as trustee of $22.9 million in hospital bonds. That’s because protecting the parcel tax from voter recall eliminates the financial losses of operating a closed hospital (which the parcel tax was created to fund), while insuring that $3.7 million in annual parcel tax remains free to pay bondholders, fees to bond trustee Wells Fargo bank, and other creditors. Young & Company’s shutdown playbook becomes even more suspicious when placed in the context of the misleading legal advice that Palm Drive’s bankruptcy attorney provided to the Board and CEO as a core rationale for rejecting the doctor-led Foundation plan to keep the emergency room open. I recently was given a video of the April 23 public meeting at which Dawson led Palm Drive’s District Board to vote to close the hospital, and reject the Foundation plan to keep it open. I carefully reviewed the segments of the video in which Palm Drive’s bankruptcy attorney Michael Sweet publicly advised members of the Board that their “role as a fiduciary” was, to earmark the tax revenues and payables due to the Hospital in order to pay its creditors. The doctor-led Foundation plan proposed that, like now, some of the parcel tax revenue not due as bond payments, and a $1.2 million lump sum reimbursement payment due from Medi-Cal due in a few months, would be used to maintain the facility and support hospital operations like keeping the emergency room open. Attorney Sweet told the Board that because the Foundation's plan utilized apportion of the tax funds and receivables to sustain the emergency room, the plan needed to be rejected, and the hospital closed. The problem with Sweet’s legal advice to the Board is that in a proceeding concerning a municipal entity like a district hospital, a bankruptcy court specifically has no power to “conclude,” anything about how it spends its money performing its public function. In fact, Section 9 bankruptcy code, which Palm Drive’s case is covered under, emphatically stipulates that the bankruptcy court has no power whatsoever to interfere with, or judge, how that municipality uses its funding provide its essential service to the public (nothing is more essential than life saving emergency room services). That’s because Palm Drive’s creditors, of which bond trustee Wells Fargo Bank is by far the largest, cannot interfere with a government entity’s core function of providing services to the public. So the court would have no position about “squandering” money to keep Palm Drive’s emergency room open. Indeed, the very reason that Section 9 bankruptcy for government entities is different than Section 11 business bankruptcies is to make sure that the financing of government operations cannot be impacted by bankruptcy claims. Below is a video of the April 23 meeting that contains the questions Sweet was answering, and his full responses. Guess Which Mega-Bank Attorney Michael Sweet's Law Firm Represents? Michael Sweet’s misleading advice seemed to be part of a shutdown playbook that benefits Palm Drive bond trustee Wells Fargo, at the expense of a public desperate to keep its emergency room open. When I dug deeper into Michael Sweet’s background, I learned that he works for a major San Francisco law firm called Fox Rothschild. A search for Wells Fargo on Fox Rothschild’s website revealed that the bank has been one of the firm’s most important clients, as readers can see here. Sweet’s reply was immediate. “It’s only a big story to one person,” Sweet replied. By this, Sweet meant District Board critic Dan Smith. Given the suffering and anxiety the closing of Palm drive’s emergency room has been causing in West Sonoma County, Sweet’s callous response surprised me. Then, I realized, it was keeping with the messaging of the shutdown playbook, that our community would accept the economic inevitability of this “new normal,” of not having the emergency room that has saved hundreds of lives here in West County for more than 70 years. Although Michael Sweet initially said he would speak more with me later, he declined my two attempts at follow up interviews, in which I had hoped to learn who signed these conflict of interest waivers (which law firms require new clients to sign when they represent parties with potential conflicts). Was it just CEO Tom Harlan, or did the Board sign them? And why did CEO Harlan, or the Board, or Sweet himself, not disclose the waivers at the public meeting in which Sweet gave his professional advice to the Board and public? In assessing the question of whose interest was being served by Michael Sweet’s pointed legal advice to the Palm Drive Board, I find it instructive to contrast Sweet’s advice, and the planned shutdown playbook, with what happened the last time Palm Drive’s finances forced it to declare bankruptcy, in 2007. To that end, I spent an hour on a Saturday morning interviewing David Heaslett, the small town attorney who brought Palm Drive Hospital through its bankruptcy, and through a three year process, until 2010, when the hospital was able to pay its creditors 50¢ on the dollar, plus show a $2 million profit. The plan, by an attorney whose firm never represented the bondholders, incorporated all the hospital’s receivables, and all the parcel tax revenue that was not required to pay bond holders to keep the hospital operating. “We found a way to use that money,” Heaslett explained. 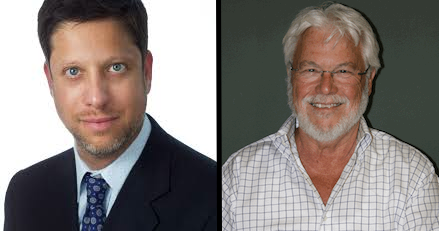 I am left wondering what might have happened had the Palm Drive Board decided to use David Heaslett to work through their bankruptcy process, instead of a firm that also represented bond trustee Wells Fargo Bank? What might have happened had the high priced out-of-town consultants hired by Palm Drive hospital not been hired to run their shutdown playbook in our community? Might the Board have accepted the doctor-led Foundation plan and kept our top-ranked, beloved Palm Drive Hospital open? My friend Jim Wheaton, a Sebastopol parent and computer programmer who has sat on two local boards and chaired one, had this to say about one of the lessons behind the closing of Palm Drive Hospital. "A non-profit board trying to make noble decisions needs to understand that if they hire people with vested financial interests in their decisions, they are not going to get good financial advice. They are gong to get advice that furthers the financial interest of those advisers, especially if you don't investigate their financial interests." Next week: Why Palm Drive lost money, the financial challenges of a small rural hospital, and the a look at the doctor-led plan to re-open Palm Drive Hospital. Jonathan Greenberg is founder and CEO of Progressive Source Communications and a Huffington Post blogger. An author and investigative journalist, his work has appeared in the New York Times, The New Republic, GQ, New York Magazine, Forbes and Money. 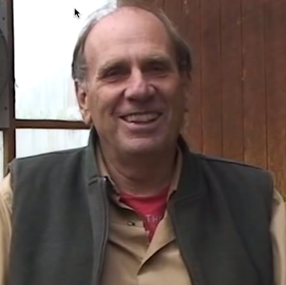 Jonathan resides in Sebastopol. Last edited by Peacetown Jonathan; 06-07-2014 at 08:23 PM. There is a special meeting today at 5:30 pm of the Palm Drive District Board concerning the future of the hospital. More info here…. Your efforts to help with this issue, and to expose the (possible) corruption, mismanagement, and lack of transparency, are greatly appreciated by myself,and, I'm sure, many others in our community...Thanks, Jonathan ! I thought it would be a good idea to link to the FB page set up by our dedicated local advocates for keeping our hospital going: https://www.facebook.com/pages/Palm-...01495476670626 . Last edited by Barry; 05-23-2014 at 04:18 PM. I would like to ask everyone to take a deep breath. These board members are our neighbors and have VOLUNTEERED - some for many years - to run our hospital and do their best to carry it through many previous crises. They are not vindictive self-interested people. What happened to peace and love Sebastopol? I am actually pretty shocked at the vitriol and abuse that is being flung at our neighbors. Yes, maybe they made some mistakes - what would you do in their shoes? Can we band together to try to work out the best possible solution rather than turn this into a war that will serve no one? I understand they are currently in negotiations with the Foundation and perhaps others. Let's support these efforts rather than attack them as if they were demons. Click the link above to see the article. Last edited by Barry; 05-23-2014 at 04:41 PM. What Would You Do In Their Shoes? First, I want to agree with you that the Palm Drive District Board members are not "self-interested, vindictive people." I have found no evidence of any corruption on the part of any member of this board. Second, to also agree that they have volunteered, and are our neighbors, and are working hard to do what they think is best. Those things being said, I would like to respond to what I think is a rhetorical question: "what would you do in their shoes?" Because it is not a rhetorical question. And the answer, I think, was provided by many of us this afternoon during our public comments. I would enjoy hearing from other readers of this, as replies to this post, what they would do in their shoes. ?And, Scamperville, perhaps from you, as well, as to whether you think they made mistakes, what they might have done differently, and what you would have done in their shoes? 1) I would order the CEO to fire the bankruptcy attorney who works for a firm that also represents Wells Fargo Bank, who provided suspiciously, clearly misleading advice, to the Board and public,as evidenced in the video above. I would then hire David Heaslett as the bankruptcy attorney to work on a solution that re-opened the ER and hospital, As noted in the article, Heaslett is the bankruptcy attorney that successfully brought the hospital through bankruptcy, and profitability, between 2007 and 2010. 2) I would apologize to the public for refusing to hear that the people of our community want to re-open the emergency room. Ours is a community clearly unwilling to go quietly into the night of the "new normal" of a community that allows the sickest among us to die, or suffer, because a multinational consulting firm told you that we cannot afford to keep one open. I have yet to hear a Board member disagree with the assertion made last Friday in bankruptcy court, by a Hospital paid attorney rejecting mediation, that there is "no evidence" that our community wants an emergency room. Scamperville, do you feel that this statement was accurate? 3) I would express my support for doing whatever necessary to work with whatever group presents the most compelling plan THAT REOPENS THE EMERGENCY ROOM and acute care facility, with ancillary, profitable operations, local doctor participation, and the support of donors behind it. 4) I would announce that the ONLY proposals our Board wil consider are those that restore the emergency room, an objecve that every single speaker we heard from this evening wanted to do. 5) I would make very clear that the $1.2 million in Medi-cal payments due in July, as well as the nearly $2 million in revenues coming from the parcel tax (after paying bond holders) ARE AVAILABLE for the operations of the hospital and facility for whatever plan can convincingly operate the hospital WITH AN EMERGENCY ROOM and acute care facility. That is what I would do in their shoes. And then work wholeheartedly, collaboratively and with goodwill, with the doctor-led Foundation plan to reopen the hospital as soon as possible. If I was unwilling to support all of the actions above, I would resign from the Board and let another person serve, a person who is willing to perform the role that I was elected to perform--a role that explicitly involves running a Health Care District that provides an emergency room for our community. In other words, if I no longer believed that a hospital is possible for Pamm Drive, I would leave the Board, and make room for someone who believed that this is possible. Because this is clearly what every person I have spoken with, and every person who has spoken publicly who is not a member of this board, or a close friend or political ally of the members of this board, want OUR ELECTED REPRESENTATIVES to do. I say this with compassion, and the hope that the fine people who have made some very damaging decisions for our community this past month will reflect on their actions, the consequences of their actions, and what they are hearing from us, their neighbors, and the citizens they have been elected to serve. Last edited by Peacetown Jonathan; 05-24-2014 at 02:08 PM. Re: What Would You Do In Their Shoes? I would suggest that the best thing to do when you are on a board that has failed at its mission or you are not able to be effective is to resign and let someone else try a different approach. There is no shame in resigning. I resigned from the district board twice, once in 2000 when it was clear that I was out of step with the physician community and once in 2012 when it was clear that the rest of the board was not open to look at other options for the hospital. In 2012, I had to choose whether to help Dr. James Gude or stay on the board and be ineffective so I chose the former and have no regrets about this decision. The current board is clearly out of step with the medical community and the community as a whole, which is what hospitals are all about and should consider that they cannot be effective in the present circumstance. This is not a judgement about anyone in particular but simply that the circumstances require a different orientation and skill set than some of the current board members have. Also, the closing of the hospital has been a major trauma for the community and the board members alike and leaves them unable to rally the community for whatever comes next. Under these circumstances it is best to get out of the way rather than continuing to resist what the community obviously wants and the district was created for; an emergency room with acute care services. Jonathan, thanks again for your work. Something was curious at last night's meeting: Mr. Dawson, I believe, said that the loss of Palm Drive's "Medicare number" (which he seemed to offer as a reason for the closure) "took them by surprise" and I wondered why they didn't know that was going to happen. Last edited by Barry; 05-23-2014 at 04:20 PM. Thank you, Jonathan, for your comprehensive reply. We all have friends and neighbors on either or both sides of the issue. This has become more personal than it should and emotions are running very high. That is why a mediator is a reasonable path to the current quagmire we are all in. That's what I would do in their shoes. Even the bankruptcy court said it was the thing to do. But, the Board members don't believe they are at a point where they need a mediator. What will it take to before they realize they need a neutral, third party to support an approach that has the best chance to bringing about a reasonable solution? The District Board must take responsibility for their actions, especially if they realize they made "mistakes". These were very BIG mistakes and need to be corrected. The consequences are serious, and for those who were not at the Board meeting last night, there was testimony about a patient dying because he had to go to Santa Rosa instead of Palm Drive and suffered a very long wait (I heard over 10 hours) at Memorial's ER, and a letter from a mother whose son was in excruciating pain for 7 hours before being seen at a SR ER. We know the wait time at Palm Drive would not be the reason that man lost his life, or the boy suffered for seven hours. People are suffering physically and emotionally because of this hospital closure and people are very angry. I hope this is not the "new normal" Sandra thinks is the trend based on the book she read. Is this how she is rationalizing her thinking? I think several of the Board members are in over their heads and they should resign if they cannot act reasonably at this very important time when we need them to step up and be the best they can be. Does anyone know how much Palm Drive is paying AMR ambulance service to be on standby sitting outside the ER 24 hours a day while there is a giant closed sign outside? Is this being done under the advice of the consultants that advised closure? Does anyone have stories of local people who have died because of the closure? I understand that the Board was caught between a rock and a hard place, but in reality they should have talked to staff and doctors and locals and not relied so heavily on consultants that have no connection to our special community. We have been told that the ambulance costs $250/hr to be sitting at the hospital. This equates to $6,000 a day or $180,000 a month. This is far more money than the ENTIRE HOSPITAL lost in 2013, it's worst recent year and another reason we begged the district board not to close but let us donate $2 million to keep the hospital going. It would have been cheaper to keep the ER, Radiology, Lab, ICU and med surge operating than to spend $180,000 a month and still not be providing adequate care. More bad news generated by the 'direction' given to the hospital by its (our) Board of Directors. At least Mr. Harlan, Mr Administrator, resigned! He was costing over $600 a day when the hospital was open ($237,000 a year) and then was being paid just over $300 a day while the hospital was closed. Why was he being paid to administer a closed hospital? No patients, no docs, no labs, what was he doing? That would have been at about $110,000 a year for being the CEO of a hospital that no longer existed. Good God! How can we get this Board to step down and let some people interested in keeping our community and our hospital alive step up to the plate and join the Board on our behalf! Oh you mean like the employees, which I was until 4/18/14, whom they called back 3 weeks later because they realized they hadn't really thought things thru about so many things... for instance picking up the mail, sorting and getting the checks from patient payments to commercial insurance checks and having them deposited you know little things like that. Not to mention all the money from hours and PTO that is owed thru the WARN ACT and is being paid thru the Bankruptcy court. Maybe if our wonderful CEO would take a slight pay cut or flex his hours like we did for months, maybe we could have gotten paid when we got let go and it wouldn't have been such a hardship on 250 employees! That would have been the right thing to do. But the board isn't thinking "right". I understand that the Board was caught between a rock and a hard place, but in reality they should have talked to staff and doctors and locals and not relied so heavily on consultants that have no connection to our special community. There is another aspect to this situation I would like to focus on: Where was the local media during this process? Many of us, particularly after the lead-up to the U.S. invasion of Iraq, have developed a healthy distrust of the traditional national media. You simply cannot trust anything published by entities like the New York Times or the Washington Post, or anything you hear on network t.v. This has been amply demonstrated. Add to that demonstration the fact that these entities are unapologetic about their role in the Iraq debacle, and that they have done nothing to reform the processes that lead to their complicity in it, and the only conclusion an attentive person can draw is that the traditional media is not to be trusted. But I'm not sure that we have developed the same level of distrust for our local traditional media. It would appear that none of the local traditional media did even a tiny bit of investigating. I would love to be wrong about this. Does anyone know of an article in the P.D. or Sonoma West that asked those advocating for the closure of Palm Drive any difficult questions? Has there been any follow-up in the local traditional media? Or is this yet another example of how the traditional media have abandoned their calling to be genuine investigators? It appears to me that the local media simply published the press releases put out by the group advocating for closure; much like the NYT and Wapo simply published what the Bush administration issued in the lead-up to the U.S. invasion of Iraq. Again, I would love to be wrong about this. But if I am not wrong, then I think we need to do a re-evaluation and a concerted questioning of the role that media such as the PD and Sonoma West play in Sonoma County and in Sebastopol in particular. Well, if they did I missed it as well. ... Where was the local media during this process? .... But if I am not wrong, then I think we need to do a re-evaluation and a concerted questioning of the role that media such as the PD and Sonoma West play in Sonoma County and in Sebastopol in particular. In the 18 years I've lived in Sebastopol, I've read a steady stream of articles in Sonoma West Times, about Palm Drive Hospital's under-utilization, lack of patients, excessive expense, and close proximity to other hospitals such as Memorial, Kaiser, and Sutter. It's easy to find villains, in the Banks, attorneys, and least of all the volunteer Board Members. To me, it's always been a simple case of too few patients and too much expense, in a context of close by superior facilities, with some people unwilling to acknowledge these realities. occasions. I've also been a patient at the hospital on two occasions over the past decade. While I received excellent care both times (once in ICU) it was also my personal observation that the hospital was way under-utilized compared to other hospitals I've been in. Too many empty rooms and too few patients. The recent comments about under utilization and Sonoma West are not addressing the issue they claim to criticize. No one denies that under utilization is a problem. No one. The issues are first, why did the local media not report on the serious irregularities committed by the Board and equally serious conflicts of interest among key people the Board hired to guide their way? WACCO and Jonathan Greenberg in particular has done far better at illuminating what is amiss with the Board's actions. Second, the local press did not report in any depth on alternative proposals or discuss the Board's seemingly inexplicable rejection of even attempting mediation with people who knew the hospital better than they did- the doctors. They are not the owners of this hospital and they OWE it to the citizens of this town to engage in good faith mediation. If they cannot do this they are unable or unwilling to perform the job for which they were elected. And so they should resign. If the Board is made up of well-meaning volunteers who have demonstrably lost public confidence and their judgment has been rejected by Sebastopolians from the Chief of Police, the Fire Chief, the doctors, to a great many citizens, why not just resign? Whjat is the ;point of continuing to obstruct? IF the Board is right they will be able to say "I told you so" when the hospital fails, and they will be listened to with greater respect when they speak on future issues because they were proved right on this one. As it is they are standing in the way of attempts to make the institution they were elected to manage work better while offering nothing on their own to solve the problem. And so have become part of the problem. Lets look at some other facts: Sutter is building a brand new hospital for many hundreds of millions of dollars (they are not planning to lose money.) This hospital has downsized inpatient services dramatically from what Sutter currently has at Chanate Road and is focused mostly on outpatient services. Willits of all places is building a brand new hospital. Hospitals like St Helena Clear Lake have made dramatic turnarounds in recent years. St Helena hospital has been on a major growth curve for a long time. Out patient services (including ER) at Palm Drive have grown over the last 10 years, not shrunk. Revenue at Palm Drive went from $22 million in 2008 to $28 million in 2010 and the hospital had a $2 million profit. If you read the PD article recently, this is exactly what all of the hospital CEOs from Healdsburg, Sonoma and Petaluma are saying; you have to focus on outpatient services. What are these? Radiology, Lab, ER, outpatient surgery, infusion, wound care, mental health, neurology, and diagnostic procedures. You still need some inpatient and ICU beds, but this is not where the emphasis is. Can Palm Drive be profitable and sustainable? As the person who managed its purchase in 1999 and got it out of bankruptcy in 2007, I can absolutely say yes. However, it has to be run like a real business, not a non-profit with a volunteer board who have never run a big business. That means that you have to COMPETE in the marketplace. This IS NOT EASY but can be done and IS BEING done all over the US by small hospitals who think outside of the old butts in beds box. How does any small company compete against the big boxes? Do something better and different than the big boys. If you walk around Sebastopol, you see small companies thriving all over. How do they do it? Screaming Mimis makes the best ice cream around! Tailor Maid makes the best coffee! Sprint gives the best service. Sebastopol Hardware stocks everything you can think of and has great customer service. Obviously we could go on and on with this! I would have laughed if it wasn't so sad that Rollie came out with his 'Palm Drive is Dead' editorial in the very paper that proves that you can compete with the big boys. Rollie will be the first to admit that it has been VERY challenging to keep the Times and News running with the newspaper business being hammered by the internet and the Press Democrat doing everything to take away his market share but HE IS STILL HERE. He has accomplished this by diversifying and publishing magazine supplements and other advertizing. Back to Palm Drive: You can't run a complex, competitive business with 5 volunteers who meet once a month and have virtually no experience running a business. You can't run any sizeable business with no marketing plan, no strategic plan, and no growth plan. This is why the Foundation is proposing a 7-9 member operating committee made up of physicians and health care business professionals to manage operations. We know this model works because it is used in Marin and other hospitals very successfully. The Foundation is bringing in Terry Newmyer, a nationally recognized expert on small hospital management on June 1st to craft a business plan with full financial proformas and comparisons to other small hospitals. This will be presented to the public in mid June. I would hope that you will review this plan before making a final judgement about whether a small hospital with Emergency Services can be viable in Sebastopol. I found the headline in this week's Sonoma West Times an interesting choice of perspective: "Judge Denies Mediation Request in Hospital Saga". Since many people read the headlines, and only the headlines, I believe this is very misleading. Here is part of the actual article, which is closer to the truth than the headline would lead most to believe. Judge Jaroslovsky actually recommended mediation in this situation and stated he had no power to enforce it. Common sense, however, is where the judge was coming from and I still do not understand why the District Board is not willing to bring in a mediator to work with the Foundation to find common ground and get the hospital open. Federal mediators are free, I have used them in union negotiations that went on for several months, and the mediator helped us get past the deadlock and differences in a month's time. I believe the community's first priority is bringing back the ER and that requires some form of an acute care hospital. I also believe that it can be profitable with experienced, and proven people in place to run it. Judge Alan Jaroslovsky’s decision, issued Monday, said the Foundation had no standing to make the motion because this was bankruptcy court and they were neither a creditor nor a debtor. He also said that granting the motion would be an unlawful interference with the district’s right, as a government entity, to make its own decisions. In addition, any result of the mediation would not be binding on the District Board. But Jaroslovsky also made it clear that he thought mediation could be effective in troublesome disputes and tried several times to persuade the hospital to agree to mediation for as little as two days or even one hour. During the hearing, the Foundation’s attorney argued that the closure of the hospital had created an urgent health care crisis in West County, and that the proposal submitted by the Foundation should be given precedence because it was the only one before the District Board that would reconstitute an acute care hospital with an emergency department. “We believe the hospital can be reopened on a profitable basis,” said attorney Robert Eisenbach of the San Francisco offices of Cooley LLP. He acknowledged that it was a legal stretch for a Bankruptcy Court Judge to appoint a mediator in a situation such as this; that the District Board was not bound to accept the results of any mediation; and that the Foundation had no standing to bring the motion because it was neither a creditor nor a debtor nor was it in litigation with the hospital. Attorneys for the hospital, however, said the request would amount to “a sweeping interference” with the District’s decision-making powers, which is prohibited by law. I also would like to point out that the employees of PDH did furloughs last year all summer, we gave up retirement contributions for months, we were pigeonholed into only one choice for healthcare coverage, and the hospital went through 2 rounds of layoffs (or as they called it "right sizing" ) in fall 2013 and early part of 2014. All of this was because we were told we needed to to "cut expenses" and we were "financially fragile." I am wondering why this did not work for PDH? PDH has supposedly reported similar revenue for the past few years so in theory this should have worked, HOWEVER... expenses increased over a million in 2013??? With all of these supposed expense cutting measures how is this possible and what were they frivolously spending on? One last note, with all the "revenue is not there due to a census drop from 9 to 4" discussion, why have they not ever discussed that a major portion of lack of admits was due to an imposed EMR admit process that we know one of the primary admitting MD's of Sebastopol could not utilise. Wouldn't have been a good idea to notice this trend in the first month and remedy it rather then let it dwindle from 9 to 4 patients over the months and not say or do anything about it??? Something smells fishy and I hope Johnathan can continue to find the source. Thank you to all of you who post. I am particularly grateful for the insightful and informative post from farmerdan. As someone who is a third generation Sebastopol resident, the closing of Palm Drive has been difficult for me to see. It is clear that the Foundation is actively pursuing its re-opening and for that I am grateful. And still, if there is to be a hospital here, and not only an ER/Urgent Care facility with various departments attached, might we not also look to getting some boots on the ground by those of us who are willing to be trained to do so and do some old school door to door lobbying for the multitudes of West County residents who currently have a Kaiser plan to switch insurance to one that would be taken at Palm Drive? With the advent of Covered California and 'Obamacare' now in force, the old paradigm of being unable to switch because of pre-exitsting conditions is no more. Surely a cadre of volunteers who know the insurance plans out there and can sign folks up would be able to canvas West County and make a dent in the numbers that we need to make this a viable hospital. Just a thought. Again, thanks to all for the spirited conversation and thoughtful posts. Someone asked Joan why Wells Fargo would want to see Palm Drive Closed? From my perspective, this is an understandable but flawed strategy because it does not factor in the determination and persistence of the community to have a hospital and it underestimates the likelihood of a repeal of the parcel tax if they are successful in keeping the hospital closed. Wells Fargo is the trustee for the Palm Drive Health Care District Bonds that were sold in 2004 ($10 million) and 2010 ($12 million). As the trustee, Wells collects the tax money and pays the bond holders and has a fiduciary responsibility to the bondholders themselves. This includes making sure that the parcel taxes remain in effect and are available to pay off the bonds. The problem for the bond holders is that the rating of the bonds is now 'junk bonds', which means that the bond holders can't sell them without taking a big loss. When the first $10M in bonds were sold, they were rated BBB, which is the bottom end of investment grade. That's why the interest rate was lower (4.3%) than the second bond sale (7.5%) when the bonds were rated at BB-, a junk bond rating. In this approach, Wells is playing a game of chicken with the community. What they are betting is that they can keep the district board on task to keep the hospital closed and can use their PR guys to fight off a repeal of the taxes by the voters. Their first step in this process was to get the district to hire a Wells friendly law firm, Fox Rothschild by waiving the obvious conflict of interest. (At least one board member stated she had no recollection of this waiver.) Next they brought in a PR firm disguised as a different company to manage the public perception of the closure. If they are successful, they get to keep all of our money and collect all of the interest from the tax payers AND get a better rating on their bonds! No doubt this also looked very appealing to the district board members because they would have a pot of our money ($1.8 million) every year to play with and no troublesome hospital to have to run. Yow! This “bright future” with a “new, sustainable form/model” constitutes no less than the privatization of what is owned by the community that will NOT provide acute care and emergency services. Please note that the Palm Drive Healthcare District was specifically formed in order to support an acute care hospital with emergency services. This is what people are paying taxes to support. You can see that from Wells point of view, this is exactly what they want, 'a quick and easy close of the hospital' and 'protect the parcel tax.' This proposal adds that the PR firm will manage the campaign to fight off a repeal effort if one is mounted. The community is just waking up to what we have lost and we are finding out WHY we lost it. We already know of deaths that might have been prevented if Palm Drive's ER was operating and lots of stories of long waits and poor service in Santa Rosa are floating around. My own read on this is that the community will do everything in its power to reopen the hospital including dumping sitting district board members who are loyal to the Wells playbook. Also, I have not talked to a single person who has said they will vote to keep the parcel tax if there is no hospital. While we are not supporting a repeal at this time because we want to see the hospital reopened, we would certainly join the effort if the district board is successful in keeping it closed past November. In other municipal bankruptcies like Stockton and Detroit, the bond holders took a serious haircut (they had to give up some of their value.) This ranged anywhere from 40% to 100%. Given that we are going to raise donations to reopen the hospital, the bondholders should have to kick in as well. Then, there will be enough money to restart the hospital and get it to cash flow. It should be mentioned that the purchasers of the 2010 bonds KNEW that if the hospital closed, they might lose ALL of their money if the voters repealed the tax. This was spelled out IN THE BOND DOCUMENTS. This is why the interest rate is so high (7.5% tax free.) The problem is that the board and their attorney are not about to force the bondholders into submission because they are all in bed together. Right now, we are focused on reopening the hospital and are hoping for a religious conversion on the district board, however remote that might currently seem. If that does not work, there will likely be a recall campaign and the elections in November might change things. If neither of these works, repealing the tax will be our only option to prevent Wells and the district from running away with our money. Last edited by Bella Stolz; 05-27-2014 at 12:29 PM. I have been in this community for about a year now... and mmmm I thought the goal here was peace and healing? That being the case. Why do we want to focus on filling hospitals just to pay salaries? Mmmm seems counter productive to peace? Quantamphysically counter-productive? No one is advocating sticking people in hospitals who don't belong there. Where "marketing" has been discussed in this thread, I think the evident intention is to maintain a care facility close at hand rather than farming everything out to the large institutions in Santa Rosa, while finding an economically viable way to do that. The care I received at Palm Drive was life-saving. It could have been gotten in Santa Rosa only at great inconvenience and, without Palm Drive's outpatient services, a huge personal cost. For some tests and for my heart operation, I was referred elsewhere — there was no urge on the part of my local medical team to keep me bedded there — but it was a deeply valued way-station. The focus of this discussion is not on "paying salaries." It's on healing. "Peace" — well, maybe not. Maybe we need to raise a bit more hell. A quick note on the responses to my post on local media coverage. I want to thank Tommy, and others, for pointing out that there has been consistent local coverage re Palm Drive's financial situation. That changes my view of the situation. At the same time, I think Gus's response is also to the point. In other words, I think I likely overreacted regarding local coverage because I find the closing of Palm Drive to be a serious blow to our community. And I remain puzzled as to why it was considered necessary; so far as I can tell there exist several options for keeping Palm Drive open. I don't understand why they aren't being given more attention. There is another view that I would like to place into consideration. People have talked about hospitals as businesses and hospitals as non-profits, but I have noticed that the idea of hospitals as a public utility has not been raised. In this era of privatization it probably seems quixotic to even raise the idea of extending the concept of public utilities to embrace hospitals. On the other hand, it may be that at a juncture like this it might be just the right moment. Your post is right on. Hospitals provide a local utility purpose in the form of access to Emergency care in the same way that a fire department, school or sewer system does. Without Emergency services close at hand, people die or are permanently disabled. That being said, hospitals are also businesses that compete with each other for dollars. This makes them unlike schools, fire departments, and sewer districts.Whether they are 'for-profit' or 'non-profit' really does not change them very much in my experience. Sutter is a non-profit that acts like a predatory for profit. Having a community owned hospital should assure that it is not closed as was being done in 1999 by HCA the corporate owner, but has not in our case. Also, when I proposed earlier that Palm Drive needed to be marketed, I was referring to the need to let people know what services are available, not to give unnecessary treatment. Hmmm, I did NOT see any coverage that the Palm Drive Hosp. was considering closing UNTIL they had already decided it as an impossible immediate fait accompli. I didn't hear "it's coming, we're on the brink, what would the community like us to do, we need XYZ, these are the issues," etc. I believe that, even if I didn't read that directly, I would've heard it through the grapevine when people responded. We heard those urgent messages the last couple times they were in crisis but not this time. Instead I hear many people say they felt stunned and blindsided by the news that this was going to be suddenly closed down. That situation was NOT described by the hospital or in the media. I feel that's inappropriate for a community resource that the community has rallied for many times, and suggests that something was at play other than putting our community needs first. If we had knowledge that this was on the brink again, we could participated in creative problem-solving. Instead we were told after the decision was made and they said there was no time to try anything. Even still, a creative solution has been offered and the hosp. won't even consider it. I just doesn't feel like they're putting our community and the hospital first. I was concerned before that, when they kept paying big fees to farm out the management to consulting companies. That was a huge cost, and I was waiting to see whether they really had the magic formula to turn this around, or would just be outsiders making their personal profit but without the investment in our community's well-being. It feels to me like the second. I wonder how the math would've worked without their fees. I wonder how the problem-solving would've been approached if it had been led by community oriented people who understood the key role the hospital plays in this region. I wonder how priorities would've been set if they had talked with key players, including the Sebastopol police and fire, who it seems are greatly impacted by the hospital's closure. These seem like really big missing steps, especially when they're charging the hospital such large consulting/management fees. There's a thoughtful opinion article in the Sonoma West from May 7th entitled "Palm Drive Foundation proposal not the answer" by Jim Horn. "Three weeks ago, the Palm Drive Health Care Foundation submitted a proposal to keep Palm Drive Hospital open. Unfortunately, its plan to restore solvency by assuming complete control and slashing employees and expenses does not solve the hospital’s basic money problems. In addition, the proposal raises a host of conflict of interest and basic competency questions that have not been answered. As a result, the hospital should continue seeking other viable proposals and partners to provide urgent care and other critical medical services for West Sonoma County." Last edited by Barry; 05-27-2014 at 06:34 PM. Mediation between the Board and the Foundation seems like the best way forward. What does the Board have to lose? It has already lost its credibility. Bovines - Boring Or Bedazzling? Stay Tuned!